You have taken a few ballroom dance lessons and are starting to get more serious about dancing. It's time to look into purchasing some dance shoes! A pair of quality dance shoes, with its special construction and materials, will help you learn better and dance longer. Below are 7 important things to consider when choosing the right dance shoes. When you first try on a pair of dance shoes, make sure they fit snugly without excessive pressure. This will give you the most control of your shoes even after they are broken in. I usually go a half or full size down for my dance shoes. Generally, open toe shoes are designed for Latin and rhythm dances, such as Salsa, Rumba and swing, which require more pointing of the toes and articulation of the feet. The opening in the shoes allows you to point your toes easier and execute footwork more precisely. Closed toe shoes are designed for smooth/standard dances, such as Foxtrot and Waltz, as these dances require a more traditional classic look. For beginners who are learning multiple dance styles, open toe shoes or Latin dance shoes are recommended since you can pretty much do all styles in them. 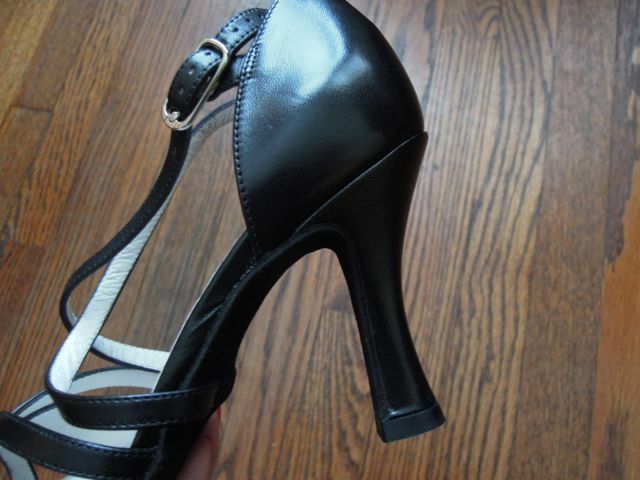 The heel height for Latin and ballroom dance shoes ranges from 1.5" to 3". For beginning dancers, you should choose a heel height that gives you the most comfort. If you are not accustomed to wearing heels, you may want to start with shoes that have a lower heel to start with. Also, there are different shapes of heel, such as slim and flared. A flared heel is a popular choice as it gives you more stability. For men's dance shoes, a 1/2" heel is designed for ballroom dance styles while a 1.5" Cuban heel is designed for Latin dance styles. Unless you are participating in dance competitions, a 1/2" heel is generally sufficient for both ballroom and Latin dancing. Suede soled shoes are perfect for dancing. It is recommended to have a suede sole for your dance shoes. The suede sole gives you the right amount of slip and traction so that you can feel more balanced and have more control when turning and moving around the dance floor. very once in a while, you need to brush the suede sole with a wire dance shoe brush to maintain its roughness. Whether you order shoes online or purchase them in a store, I suggest you first go to a dance supply store to try on some shoes. Since sizing can vary from brand to brand, it is best to try and compare various brands, sizes and models to ensure you find the right fit. Moisture is the no. 1 thing that kills a shoe. After dancing, I usually use shoe trees to absorb moisture and keep the shape of the dance shoes. Cedar shoe trees are particularly great for fighting odor! Unfortunately, dance shoes are not made to last for a long time due to their delicate materials and the way dancers use the shoes. To extend the life of a pair of dance shoes, I recommend having 2 or more pairs of shoes (depending on how frequently you dance) to rotate between dance sessions. This allows each pair enough time to dry out before the next use. Also, never wear your dance shoes outdoors as the suede leather is very delicate and can be damaged easily by any harsh objects and water! The cost of Latin and ballroom dance shoes range from $80 to $300 a pair depending on the brand and quality. For about $170, you can get a great quality pair of shoes. It is definitely worth spending a little more money since a good pair of dance shoes can last much longer and give you more comfort and support when learning to dance. I hope this is helpful to anyone who is buying their first pair of ballroom dance shoes! Also, check out a video I’ve made about ballroom dance shoes below. Please leave me a comment if you have any questions. I'd love to help! Top Songs for a Surprise Groomsmen Dance!